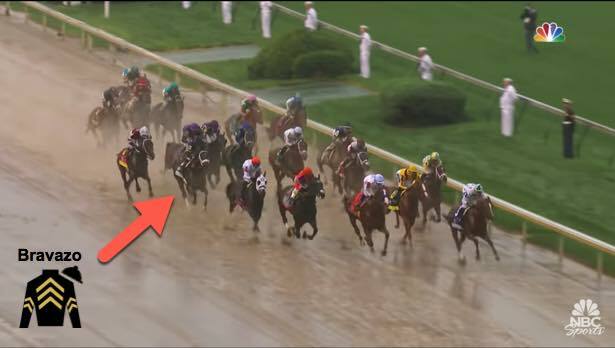 Justify was such an impressive Kentucky Derby winner that he looks nearly unbeatable in the 2018 Preakness Stakes. He has been installed as the 1-2 morning line favorite for the Preakness. On top of that, Good Magic ran a great second in the Derby, and is the 3-1 second choice. The next closest horse on the Preakness morning line is 12-1. 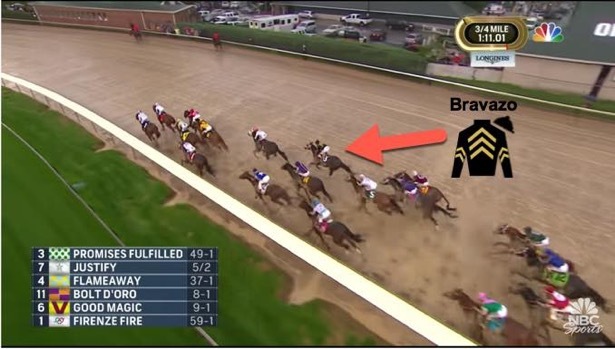 So, how can you make money on the Preakness? And of the six longshots, which one has the best chance to finish in the money and possibly upset the Top 2. We are looking at Bravazo, who ran a monster race finishing sixth after an extremely wide trip in the Derby, but his form is hidden by the wide trip and a poor effort in the Louisiana Derby. Bravazo is 20-1 on the morning line, and trained by D. Wayne Lukas, who has won the Preakness a record-tying six times. Rather than take the shortest way around the track, following the rail the entire race, jockey Luis Contreras had no choice but to go wide with Bravazo from the 13 post. The thing is, most other horses caught wide in the Derby ran up the track. But first, let's take a look at Bravazo's Derby adventure. 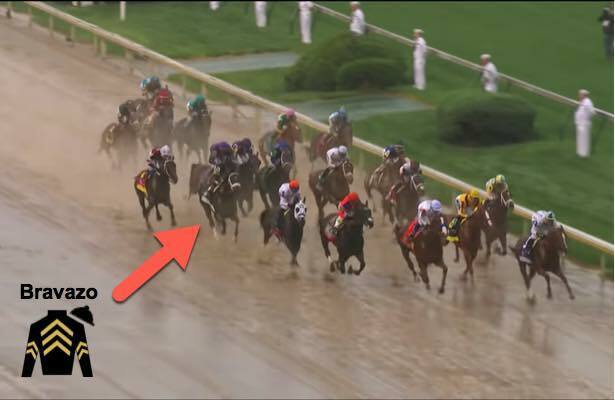 Here is a link if you want to see the full Kentucky Derby replay and watch for yourself. Bravazo was up near the pace early on, but wide in the center of the track. Note that all of the horses near him on the wide part (Bolt d'Oro, Noble Indy, Magnum Moon, Combatant) finished in the back half of the field. Justify is three-wide in the center of the track, but Good Magic (yellow cap) and Audible (10th, white cap) are benefitting from a good position. 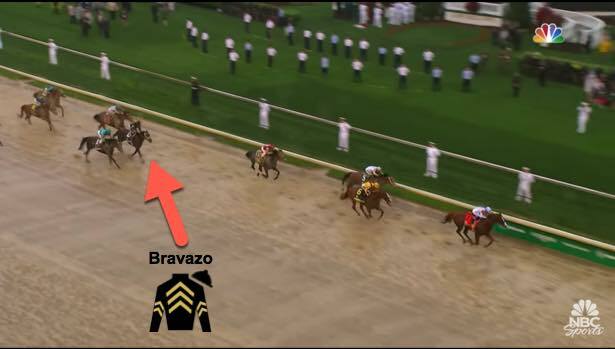 We can see that Bravazo was about six wide and losing ground with every step. He had to run harder just to keep up with the rest. On the backstretch, with no place to go, Bravazo's wide trip continued. As they turn for home, jockey Luis Contreras swung Bravazo farther out into the center of the track to avoid the mud kicking back from rivals. But this forced him to go wider, still continuing to lose ground. Now Bravazo is about seven-wide, but importantly, he is still chugging along and not quitting. The two leaders have pulled away, and Audible makes his run from the inside, getting a perfect trip on the rail. In this shot, Audible has moved into third and making his run. What is interesting is that even after the wide trip, Bravazo is still moving forward and about to take fourth. In contrast, all of the other horses around him are backing up, other than Instilled Regard who came from far back. Bravazo is still running on after losing all those lengths on the trip. 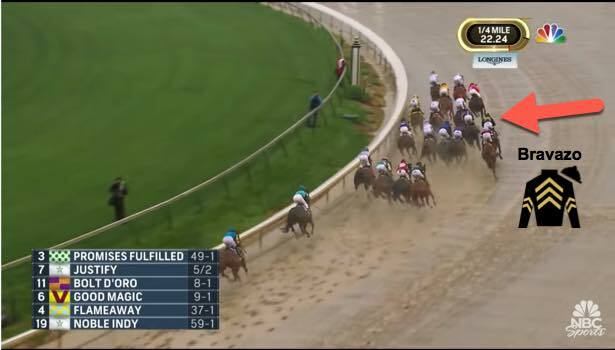 My Boy Jack on his outside is just passing into fifth as they are nearing the wire, and Lone Sailor (seventh, inside) never catches Bravazo despite benefitting from a rail trip for the entire race. So, how wide was the trip? The question is, how many lengths did he he lose and what does this mean for his chances in the Preakness? Fortunately, Trakus can help us with that. Trakus is the data company that charts every horse's trip with an RFID chip in the saddle towel. They use this to measure how many feet each horse traveled in running in the race. (This can be found publicly at the Trakus website). Below is the Kentucky Derby finish and the number of lengths each horse traveled relative to the winner, Justify. 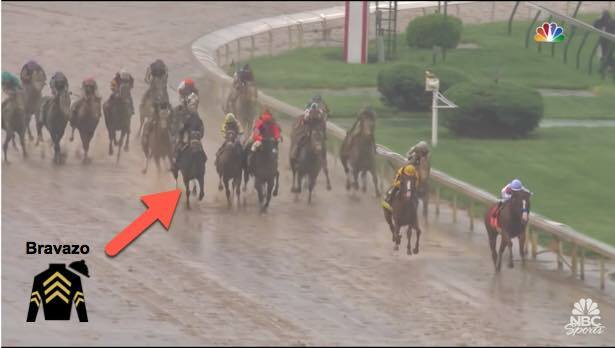 It is worth noting that Justify ran a good portion of the race about two to three paths off the rail, so there are many horses that actually took a shorter trip than Justify. They are listed in negative feet traveled compared to Justify. According to Trakus, Bravazo traveled farther (due to the wide trip) than any other horse in the race except Magnum Moon, who finished 19th. Of all of the horses finishing in the Top 8 in the Kentucky Derby, only Bravazo and Instilled Regard traveled significantly more feet than Justify. How does that translate to the Preakness? In the Derby, Bravazo finished sixth by 8 lengths. So it would stand to reason, that with an even trip, he still would be about 2.8 lengths behind Justify. But where it gets really interesting is that Bravazo only finished 5.5 lengths behind Good Magic in the Derby, but lost 5.75 lengths of ground relative to him. 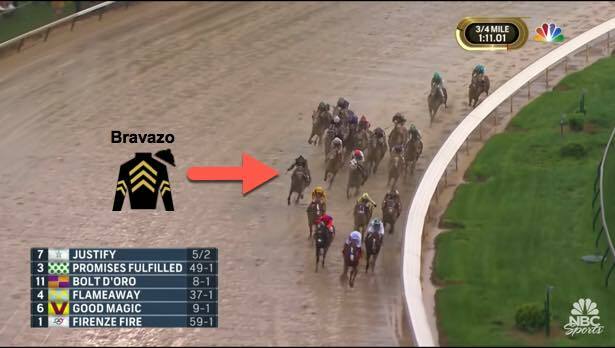 This puts Bravazo on a par with Good Magic, when Good Magic is 3-1 in the Preakness and Bravazo is listed at 20-1. Also, important in such a small field, if Bravazo is 10 lengths better than Lone Sailor, who is 15-1 morning line in the Preakness, then that is one challenger in this short field not to worry about. Was Bravazo's Derby a fluke? • He only ran well in one major race, the Grade 2 Risen Star, which isn't one of the top Derby preps. • He won the Risen Star at 21-1, so he can be dismissed as a longshot that got lucky. • He was only sixth by eight lengths in the Derby, not enough to draw attention or warrant a further look for most. But looking at his Brisnet past performances below, I am suggesting there's another outlook. If you forgive his Louisiana Derby race, for whatever the reason, and upgrade his Kentucky Derby race for the huge effort on the wide trip, this is a very good horse. Also importantly, there were six weeks between the Louisiana Derby and the Kentucky Derby, so there was extra time for him to improve (most preps were four weeks before the Derby). And if you consider that we can't really evaluate his talent in the Louisiana Derby due to the poor finish, then there were almost three months since he recorded a 98 Brisnet Speet Rating when winning the Risen Star. With three months of training and improvement, it is not unexpected at all that he might improve to run a number in the low 100s in the Kentucky Derby. Bravazo ran a 93 Brisnet Speed Rating in the Derby, while Good Magic ran a 99. According to Brisnet spokesman Ed DeRosa, at the Kentucky Derby distance, one length is equal to one point on the Brisnet final speed rating. So if we adjust for the 5.75 lengths that Bravazo ran further in the Derby, that would give him a figure of 99, identical to Good Magic. Finally, adding to the theory that Bravazo is improving, he was feeling so good that trainer D. Wayne Lukas worked out Bravazo on May 13, only eight days after the Kentucky Derby. None of Justify, Good Magic or Lone Sailor have worked out since the Derby. As we look at wagering on the Preakness Stakes, it's a difficult race to make money on as everyone saw the impressive runs by Justify and Good Magic in the Derby. But if you are evaluating Bravazo as good or nearly on par with Good Magic, then you have a good opportunity to make money on the race. One final point for the Preakness is that if Good Magic is trying to turn the tables on Justify, it's possible that Good Magic's chances are compromised trying to chase Justify early. For wagering suggestions, you can start with more obvious combinations such as a Trifecta with Justify over Good Magic over Bravazo, and then play Exactas and Trifectas where Bravazo beats Good Magic. Because the Justify-Good Magic combination will be played so hard, Bravazo would pay out well to run second. Can Bravazo win? Absolutely. This is horse racing. 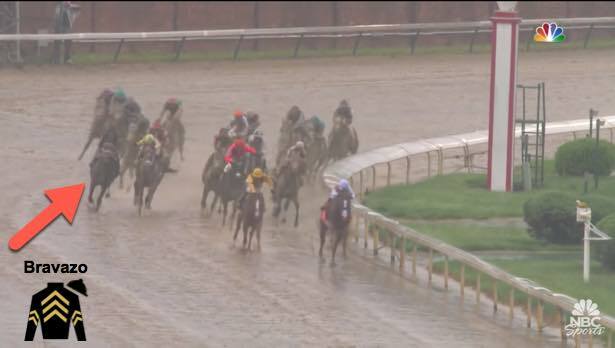 And if you remember the 2013 Preakness Stakes, a 15-1 shot named Oxbow won in the slop and defeated the big favorite, Orb, who ran fourth at 3-5. Oxbow was also trained by D. Wayne Lukas, owned by Calumet Farm, and was coming off a sixth-place finish in the slop in the Kentucky Derby.